The right home staging courses help you become more successful faster by saving you years of trial and error figuring out everything on your own. Do your research to make sure you're investing with the right company to get the results you want. Home staging is a rapidly growing field and because of that many individuals (and even large companies) are jumping on the training bandwagon and creating a home staging course. It’s “buyer beware” because not all programs will meet your needs. This is a completely unregulated field, so it’s wise to do some research before jumping in. Here are 15 questions you can ask to try and find the right program for you. 1. If a program offers hands on training, how is it done? There are far too many stories of groups of 40 or more people spending most of their day in their own (or a rental) car driving to various far-flung locations only to take turns rearranging a living room. Don't be fooled by "As seen on HGTV" logos on a website. Can you actually see them in the media? Are their screen shots of their appearances? Are they featured on any media websites? 3. Will the training prepare you for the realities of being an entrepreneur? A worthwhile training program should really cover all these areas; otherwise they are just talking to you about what will amount to nothing more than a creative hobby. 4. Does the trainer have real world experience starting and growing a profitable home staging business? If they haven’t done it, how do they know what they’re talking about? When Debra Gould did her Masters degree in business/marketing, she found professors spouting all kinds of great theories, but only the professors who had actually worked in the real world offered anything really useful or actionable. 5. 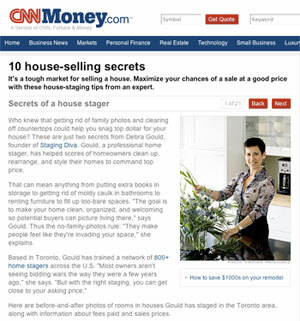 Has the trainer proved they know how to get media attention for their expertise as a home stager? If not, how will they teach you to do it? Media attention is also independent proof that this person is considered a leader in the field. If you’re going to take home staging courses, would you rather learn from someone nobody has ever heard of, or would you rather learn from a recognized expert? 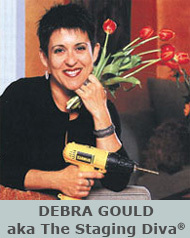 Debra Gould hosts an Ask Staging Diva Live event approximately 10 times a year to give people a chance to spend 90 minutes on the phone with her asking their questions. You can listen to a FREE recording of Ask Staging Diva Live right now. 7. Is free information available to aspiring stagers and others or is it all about the money? Is the free information quality content or just fluff? In addition to her newsletter, Staging Diva Dispatch, Debra Gould has been writing the Home Staging Business Report for years. 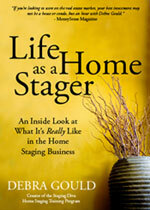 You can read hundreds of free articles that will help you in your staging business. Debra’s best secrets are reserved for paying students, but you’ll still find tons of value when you aren’t yet part of her “inner circle”. 8. What do past students say about the program? Does the company make it easy for you to find past students, for example by writing about them, featuring them on a website, etc? If all you see are fairly anonymous testimonials (initials instead of full names, no photos, no location or company name), then consider this a red flag. Anonymous testimonials can mean the company just made them up! 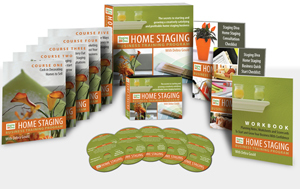 If you’re considering taking the Staging Diva Training Program, you can call Debra Gould directly at 416-691-6615. If she’s out at a client she’ll call you back. Or you can get quick answers to your questions by emailing us. If you sign up for the free quiz in the red box on the left of this page, you’ll get invited to a free Ask Staging Diva Live event where you can join other aspiring home stagers in a 90 minute conference call with Debra where she answers everyone’s questions! 11. Does the program offer a Satisfaction Guarantee? In other words, will you get your money back if it’s not what you expected? The Staging Diva Program comes with a 100% money back guarantee if you’re not satisfied by the quality of the program. 12. Is the format of the program or the way it is delivered practical for you? Airline travel is no picnic these days with all the security issues and delays. Will you have to travel or be away from family or your job for a few days to take the program you are considering? If the program is offered online, will you need special equipment or technical knowledge to participate? The Staging Diva Program can be mailed to you in a convenient Home Study Kit consisting of printed materials and CD recordings. Or you can order the downloadable program which gives you all your course notes, checklists and audio recordings delivered right onto your computer. No special expertise or equipment is required as long as you have a computer from this century! Beware of promises of guaranteed jobs, or unlimited one-on-one access to the president of the company forever. Use your common sense, neither of these claims are realistic! If you are being promised something that is too good to be true, this should be a warning sign that all may not be as it seems. Staging Diva Graduates get this badge to put on their websites as well as a personalized certificate with their name on it. The difference is we don't pretend that you can't be a stager without these things. Home staging is a completely unregulated field with no official credentials. If a company tries to scare you into taking their program by telling you they have the only “real” credentials, does that seem like the right way to do business? If they promise you’ll be able to put some initials after your name following their course, do they tell you upfront that you may be expected to pay an ongoing fee to do so? Or, does the training company admit that home staging is a completely unregulated field that does not require any credentials or training at all? If there is anything misleading in their marketing, you should wonder what other surprises may await you. Once you buy the program, are you on your own? Are there special programs for graduates like: coaching, marketing support, project referrals, etc? We offer many ways for you to have ongoing support, for example Staging Diva Network, Staging Diva Dialog, free monthly newsletters and the free Home Staging Business Report. 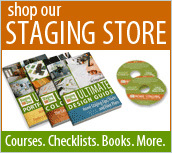 You can see our full range of products and services in the Staging Diva Store or download your guide to all our products and services here. Don’t assume because a program costs more that it is better. Make sure you’ve answered the above questions so you know what you’re getting for your money. While there is a wide variation in the costs of home staging training, this should not be the first criteria. The reality is that home staging is a very lucrative business if you know what you are doing on the business side. So, whether you spend a few hundred dollars more or less on a program is not significant when you consider the big picture. The key is getting what you need from a program and positioning yourself to take your passion for decorating and interest in real estate and turn it into a profitable and creatively satisfying business. Internationally recognized home staging expert Debra Gould is President of Six Elements and creator of The Staging Diva Home Staging Business Training Program. 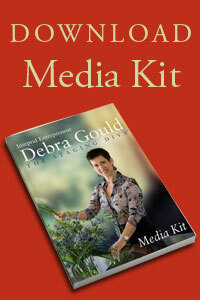 Debra has personally staged millions of dollars worth of real estate and uses her expertise to train others worldwide. She is a frequent guest on TV and radio shows about staging and has been quoted in major media including: CNNMoney, Wall Street Journal, MoneySense Magazine, Reader’s Digest, Women’s Day and more.